mayor’s position and as the NDP candidate for the federal riding of Windsor-Walkerville. The 1974 mayoral contest was memorable as well as successful for Mr. Weeks. Polling needed to be held over two days while blizzard-like conditions pounded the city. When the storm cleared, Weeks had bested the incumbent, Frank Wansbrough, by just over 700 votes; a result confirmed by recount. Bert Weeks went on to wear the mayor’s chain for Windsor for the next eight years until he retired in 1982. Although socialist in his sympathies for public welfare, Mayor Weeks was conservative in the use of tax payer money. At the same time, Weeks saw the need to diversify the local economy. He presented a plan to expand the Cleary building. He supported developers in the quest to build a new hotel in the city core, but not on the waterfront. Weeks promoted Windsor as a host location for the 1976 Canadian Open Golf Tournament. During his second term, Weeks convinced Maple Leaf Mills and the United Cooperatives to locate facilities here. He pursued and obtained additional money from senior governments to finance the construction of the E.C. Row Expressway, the creation of the Ford engine factory and the expansion of the GM transmission plant. Weeks was born on July 1, 1917 in Montreal P.Q., and raised by his widowed mother in Duplessis-era Montreal. Observations of the effects of the Depression and the government of the day’s disregard for civil liberties gave rise to Weeks life-long concern for social justice, and he became involved with the CCF party in Quebec. He moved to Windsor in 1946, where he opened a jewelry store that remained in operation until 1980. An avid gardener in his private life, Weeks oversaw the development of nine new parks within Windsor, including Coventry Gardens and the Ganatchio Trail. Due to his vision, old industrial lands adjacent the Detroit River were acquired and turned into a grand public space along the waterfront. 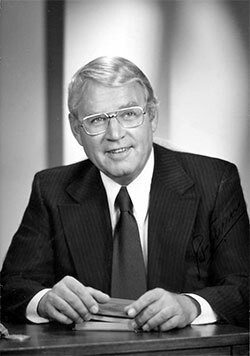 Ill health lead to his decision not to run for mayor again in 1982, but Weeks did not retire completely from public life. He won a position on the Windsor Utilities Commission, and later served as the vice-chairman of a provincial panel considering the management of industrial waste in Ontario. Albert Weeks died of cancer at age 73 in 1990. In September 2005, City Council honoured the former mayor’s contributions with the official opening of the Bert Weeks Memorial Garden, located on the waterfront between Parent and Langlois Avenues.